To at least get rid of the latter, I thought about setting the “40MHz intolerant”-bit on our managed clients – and did some lab tests with interesting results. With the 802.11n-2009 Amendement, the possibility to bond two 20MHz-channels together to a single 40MHz-channel was introduced. This feature alone improves the data-rate by 108/52 (by factor ~2.077 – as the number of data-subcarriers increases from 52 to 108). In contrast to the 5GHz frequency band, in the 2.4GHz frequency band, the available spectrum is very limited, and it allows only one 40MHz-channel, which will cause at least CCI, and at worst ACI, as soon as there is a second AP within earshot. Because of the inevitable problems that would occur in the 2.4GHz band when 40MHz-channels are used, the “40MHz intolerant”-bit was introduced as a failsafe-function in the 802.11n-2009 Amendement. An HT STA 2G4 shall set the Forty MHz Intolerant field to 1 in transmitted HT Capabilities elements if dot11FortyMHzIntolerant is true; otherwise, the field shall be set to 0. A STA 2G4 shall set the Forty MHz Intolerant field to 1 in transmitted 20/40 BSS Coexistence fields if dot11FortyMHzIntolerant is true; otherwise, the field shall be set to 0. A STA 2G4 that is not an HT STA 2G4 shall include a 20/40 BSS Coexistence element in Management frames in which the element may be present if dot11FortyMHzIntolerant is present and dot11FortyMHzIntolerant is true. A STA 5G shall set the Forty MHz Intolerant field to 0 in transmitted HT Capabilities elements and 20/40 BSS Coexistence fields. It says that it is only available for certain adapters. None of the 2 mentioned above are included, but still, the option is available for both of them in the advanced adapter settings, so I decided to give it a shot anyways. As you can see, the “40MHz intolerant”-bit is set to 1, which is exactly what I wanted. So the client was connected to the 5GHz band, and was sending its Probe Requests in the 2.4GHz band with the flag set. I can’t say if this occurs with the adapters listed as “supported” on the Intel website aswell, because I don’t have them available at my place,. 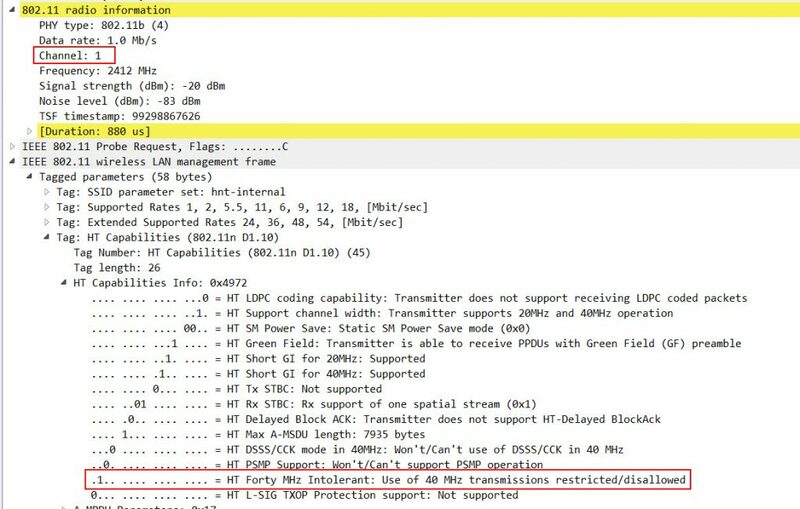 As far as I am concerned (based on my interpretation of the 802.11-2016 subclause 11.16.11), the 2 tested Intel wireless cards do not follow the standard and you should not use the setting “Fat Channel Intolerant”, as it impacts your 5GHz aswell! I welcome you to give me an explanation about this issue if you have any- am I right with my statement, or am I off the track? 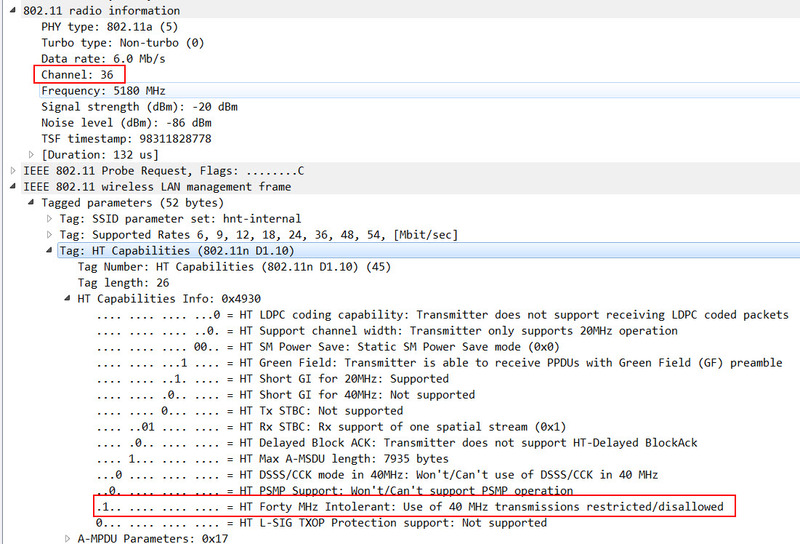 Your observation is right about 40mhz intolerance on 5Ghz, however as a wifi dev, we don’t care about that bit in 5Ghz. I observed this behavior back in 2010 for Intel devices. 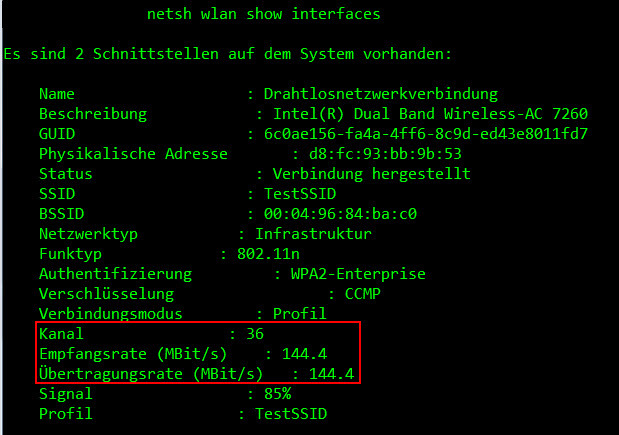 If you do an iperf wifi capture on a clean 5Ghz channel, you will see the HT/VTH frame will be sent out at HT40 or VHT40/80 (check radiotap or have spectrum analyzer to see). Most of scanner report only what they see in beacon/probe, the real stuff happen when sending data frame.